Susan Richards-Benson spent 7 years living, working and volunteering in Egypt, during which time she had her eyes opened to the harsh reality of working animals in the country. Her passion for animal activism was ignited and Born of the Pyramids: Rocky’s Story is Benson’s expose of the suffering of Egyptian equines. Narrated through the eyes of a horse named Rocky, the story unfolds from his birth in stables close to the Great Pyramids of Giza, where he is raised to be a performer. Following an unfortunate mishap, Rocky is sold to a vegetable vendor who, unlike the stable owners, is less informed on caring for a horse. Forced into hard labour, Rocky is whisked into a life that finds him both over-worked and malnourished. 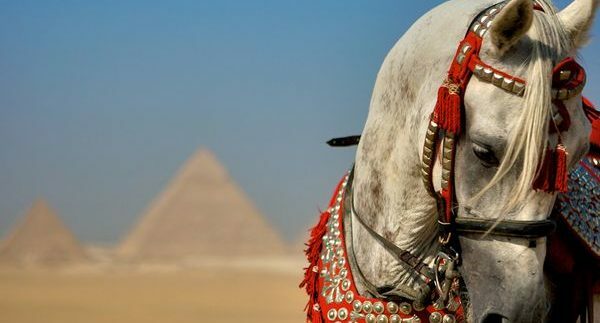 Though the book seems haphazardly put together, the author succeeds in exposing the harsh realities faced by horses in Egypt. Through Rocky, she engages the reader in various scenarios of maltreatment, such as horses being forced to wear ill-fitting bridles and the painful ritual of having ginger placed under their tails. The latter is done in order to keep the horse’s tail raised during performances. What’s worse is that horses employed to drag carts around Cairo are often hammered with cheap, used horseshoes, fitted with rusty nails that lead to hoof infections. On the bright side, Richards-Benson also tells of recovery centres and feeding clinics that are dedicated to nursing working horses back to health. But more importantly, she’s shown that like many issues in Egypt, the root of many problems lies in people’s poor education rather than having cruel intentions. From a literary stance, the prose flows like the diary of a bright, primary school child – the vocabulary is simplistic, but at times expressive. Unfortunately, Benson fails to caress the reader with words, which is essential to a plot where pain is the central driving force. Born of the Pyramids reads as a list of events, enriched to highlight the presence of animal abuse in Egypt. There is no character development, and everyone in the book appears and vanishes, merely to facilitate events. Even the narrator is the same from the first page through to the final chapter and there’s no character arc. Though it cannot be credited as a literary accomplishment, Born of the Pyramids does fill the reader with compassion in its stark portrayal of an issue that many are oblivious to. The author also donates a percentage of the book’s proceeds to animal charities. Susan Richard-Benson is both a horse enthusiast and dog lover, and during her time in Egypt she did a variety of volunteer work with dog and cat shelters, ultimately finding herself involved with working equines in the country. She has also authored Egypt Unbound; a portrayal of her personal experiences of living in Egypt. She now lives in the UK with her partner and their dog, and spends her free time aiming to raise awareness of the plight of working animals around the world.